From director Michael Radford ("The Merchant of Venice," "Il Postino") comes "Flawless," a clever diamond-heist thriller set in swinging 1960s London. Demi Moore plays Laura Quinn, a bright, driven and beautiful executive at the London Diamond Corporation who finds herself frustrated by a glass ceiling after years of faithful employment, as man after man is promoted ahead of her despite her greater experience. Michael Caine is Hobbs, the nighttime janitor at London Diamond who is virtually invisible to the executives that work there, but over the years has amassed a startling amount of knowledge about how the company runs. Hobbs has his own bone to pick with London Diamond. 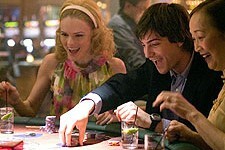 Observing Laura's frustration, he convinces her to help him execute an ingenious plan to steal a hefty sum in diamonds. But unbeknownst to Laura, Hobbs plans go even farther than he's let on, and together they set in motion a thrilling heist of dizzying proportions, the likes of which London has never seen.